Making a Simcha is a joy, but sometimes we can get overwhelmed by the myriads of details that need attending. One of the biggest challenges is putting together the guest list, sending out invitations and getting an accurate head count of those attending. 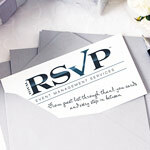 At Total RSVP we are here to take the stress out of making a simcha. We look after the details that make the difference. What you get is enjoyment, smooth planning and simcha. We offer a full host of Guest Management services for your Simcha. Hands-on Self-Access Service Streamline your Simcha using our professional online software. Utilize our web-based iRSVP self-access software in the comfort of your own home or office. Create and update your invitee list, beautifully address envelopes, track reservations and gifts, assign seats and much more! ........ Or select any combination of our white glove and hands-on services to suit your needs and budget. Get more for your wedding! Don't forget to mention ChossonKallah.com when visiting Total RSVP.